Although my late father was very good at watercolour painting, it’s not something I’ve ever really done much of. I decided to give it a go with this Craft UK lily stamp & Derwent Inktense pencils. I didn’t think it turned out too bad for a first attempt! Craft UK lily stamp, Derwent Inktense pencils, image edged with Peeled Paint Distress Ink, K & Co backing paper, American Crafts plain cardstock, ribbons coloured with Pear Promarker, Meiflower pearl ribbon buckle to finish. One for the boys! My son’s best friend will be 12 on Thursday. 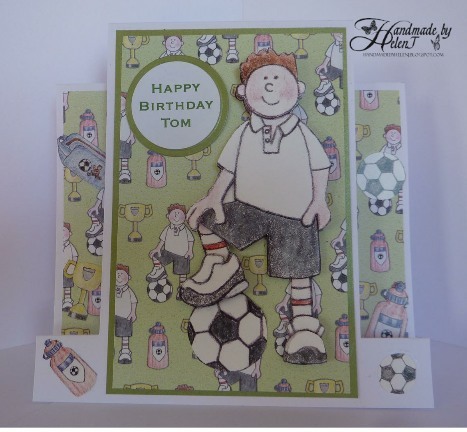 He’s very sporty so his card had to have a sports theme; I’ve had this Paper Nation decoupage in my stash for a long time. I saw a 6″ square stepper card online & came up with a template to recreate the same thing in metric (I can’t work in imperial!) I hope you find it useful. Paper Nation decoupage & backing paper, matted onto DCWV shimmer cardstock, sentiment generated in Craft Artist Professional. 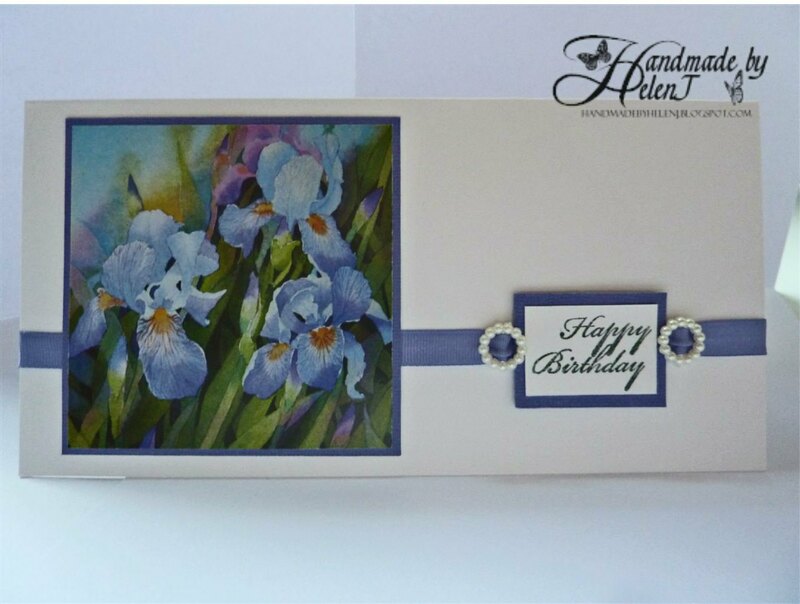 The central image for this card was created using the Clarity Hummingbirds stamp, Perfect Medium & mica powders. I made the main image a year or so back at a card class at Weavervale Garden Centre but was waiting for a suitable occasion to use it. I didn’t have the right stamp to create the greeting so had to use peeloffs, something I rarely do these days. 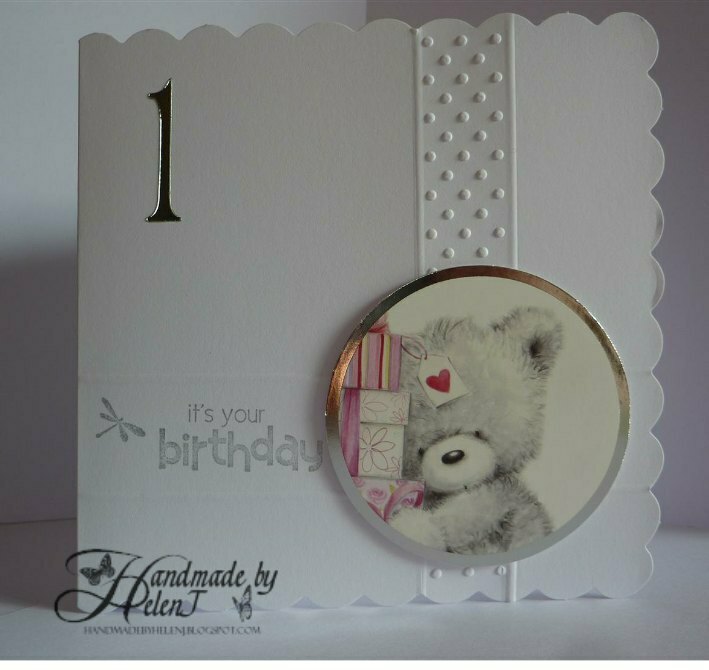 I chose a circular shaped greeting because of the circles on the main image, and a rectangular pearl ribbon buckle to echo the shapes in the backing paper. I’m pleased to say my Mum loved it! Image stamp Hummingbirds by Clarity Stamp; backing paper K & co, pearl buckle from Meiflower. The poppy stamp on this card must be my most-inked stamp. 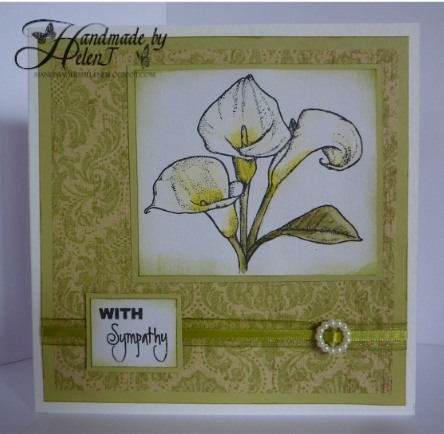 It’s by Inkylicious & it’s such a beautiful image that creating a beautiful card is quite easy! I’m still not sure about Kraft cardstock but as I’ve got lots of it I’m not going to waste it; this time I toned it down a bit with backing papers. 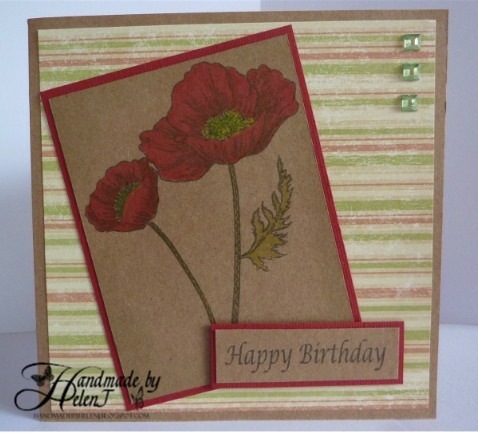 Inkylicious poppy stamp, Memento ink & Poppy promarker with yellow Coloursoft pencil. Backing paper by K & Co, gems from my stash & Kraft cardstock by Papermania. I don’t often use pre-made toppers these days but I loved this one from Hunkydory and I thought it was really appropriate for a little girl’s first birthday. As usual I stuck with clean & simple, I really should step out of my comfort zone every so often! 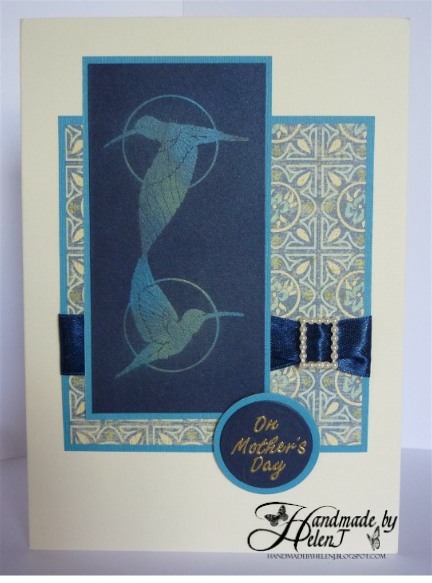 Hunkydory topper, embossing using Cuttlebug dots folder, stamps Penny Black Salutations. A birthday card for my aunt, who probably wouldn’t thank me if I posted her age! The topper is scented & is from a QVC kit which I’ve had for a long time. 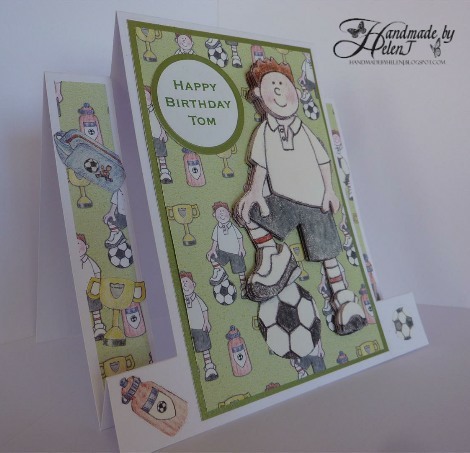 QVC kit topper matted onto Bazzill Basics card stock. Stamped greeting and 2 Meiflower pearl ribbon buckles. 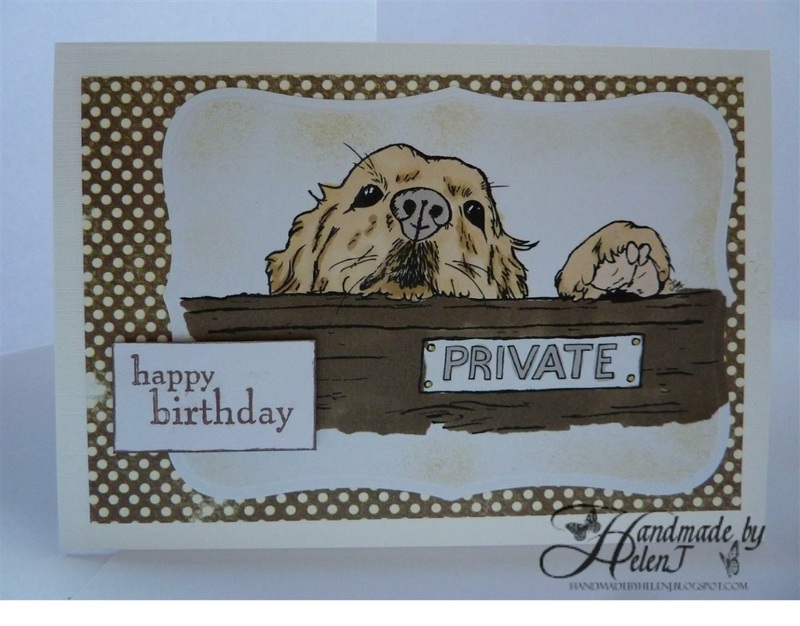 This card was for my next door neighbour who owned a big & daft Golden Retriever for a number of years. This digi stamp from Just Inklined, coloured with Promarkers, was perfect. Digi stamp (On Guard) by Just Inklined, coloured with Promarkers. Image cut with Nesties then inked with Antique Linen. Greeting stamp Penny Black Salutations. Backing paper from stash.